In the first part of a series of audio features, we discuss aspects of the Easter Rising with historians. Here John Dorney talks to Fearghal McGarry and Padraig Yeates about why the Volunteers and Citizen Army went to war on Easter Monday. First Fearghal McGarry talks about the Volunteers and more particularly the Irish Republican Brotherhood, a faction of which really masterminded the Rising. Fearghal talks about the growth of an insurrectionary tendency in the organisation under Tom Clarke and the extent to which this was fueled by a fear of national obliteration, that Ireland would become a, “compliant and even happy part of the UK”, like Scotland or Wales. More on this here. 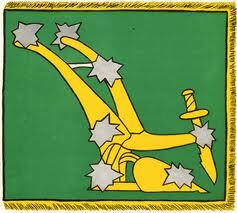 The Citizen Army flag - the Starry Plough. This was not the only tendency within the separatist camp, however, we also talk about how another faction wanted the Volunteers used in a defensive manner, so that the British would be cast as the aggressors. Some of these people, Fearghal says, refused to take part in the Rising, others felt they were honour bound to but were far from enthusiastic. Labour Historian Padraig Yeates talks about the role of the Irish Citizen Army in the Rising. The ICA was formed during the great Dublin strike of 1913 to protect strikers from the police but under the leadership of James Connolly, threw in their lot with the radical nationalist after 1914. Padraig gives his opinion of Connolly as, “a great propagandist and Marxist thinker, but a bad union organiser, who was of more use to the movement dead than alive”. He also describes as “counter-productive” Connolly’s intense antagonism towards anyone who served in the British Army, as he had himself. It might have been better, he argues, to try to inflitrate Irish units, as for instance the Bolsheviks did in 1917. Part II: Combat is here. Padraig Yeates has written, Lockout: Dublin 1913, the history of the great Dublin strike of that year. He is currently public relations consultant to the trade union Siptu. Listen to previous interview with him here and here. He has also written, “Dublin a City in Wartime”, which will be published in late 2011. Dr Fearghal McGarry is a senior lecturer in Modern History at Queens University Belfast. He has written a series of books on Irish republicanism including; Irish Politics and the Spanish Civil War, Frank Ryan, Eoin O’Duffy a Self Made Hero and The Rising, Ireland Easter 1916 and edited the collection, Republicanism in Modern Ireland. His latest book Rebels, due out in September 2011, uses eyewitness testimoney of the Rising from the Bureau of military history to re-tell the story of the rebellion. Written by: John_Dorney on 25 April, 2011.on 18 September, 2011. 4 Responses to "Perspectives on The Easter Rising, Part I – Rebels"
Cheers Michael, yep, will work on it.